Like most crustaceans, Castracollis has got hairs, spines, and claws of several sizes on its legs or appendages of various build and purpose (, see also Rhynie Chert News 34 ). Fossilisation in transparent chert has preserved these delicate objects such that, with appropriate equipment and due perseverance, they can be found and identified. Investigations on own chert samples, performed by D. Waloszek and his team at Ulm University, have revealed unexpectedly numerous and long hairs in tufts on some of the limbs, where they are neatly arranged in files, see Figs.1,2. Fig.1: Hairs emerging from mound-like bases on a limb of Castracollis, not seen at full length here or not seen at all since they have been cut off by cutting the chert sample into slabs. Width of the picture 0.4mm. Fig.2 (below): Files of hairs on a limb of Castracollis, two of them seen at remarkable length, others cut off. Width of the picture 0.3mm. Photographs: Ulm University. 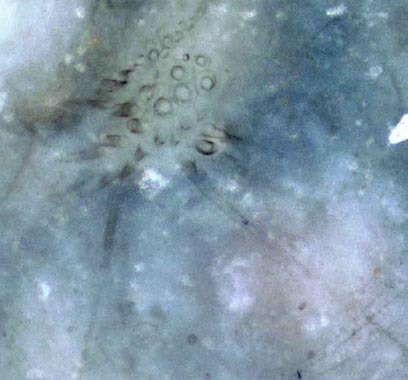 Note that these hairs with thickness less than 10µm become visible in full length only if they are slightly below and well parallel to the cut and polished chert face. Obviously, only a few, if any at all, in a tuft of hair can be expected to meet these conditions. These images provide another convincing evidence that chert is a most suitable substance for preserving tiny details of ancient creatures which would never show up with compression fossils. What remains to be found out is the purpose of these uncommonly long and slender but apparently stiff hairs or bristles. With their regular array on a bulging surface, thus resembling a manufactured brush, they differ from those on the limbs probably used as paddles.